Flaming June should bring us a hot sunshine filled month with the risk of frost passed and those in more northerly parts should be able to catch up with those in the south..
As with May, we really need to keep on top of the weeds so keep that hoe moving. Check your directly sown crops, carrots, parsnips, beetroot, turnips etc and thin as necessary. You should be safe from the carrot fly now but she will be back next month and it is probably easiest to leave your defences in place, especially if she's not heard that she is not about in June. This can be a dry month so keep an eye on the need to water. If the soil appears dry then check under the surface either by scraping some soil away with a trowel or pushing your finger in. If it comes up dry, you need to water. Don't forget to water when required. You should be continuing to plant out brassicas now. Broccoli and calabrese, Brussels sprouts, summer cabbage. Beans started in pots, both runner and French, should go into the outside too. Leeks should be ready to move to their final position this month. Ideally they want to be about pencil thickness. Don't follow the old guidance to trim the leaves and roots when transplanting leeks. It has been proven to be of no benefit and is counter-productive. Celery can go out now as well. 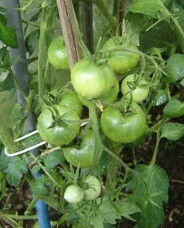 Outdoor tomatoes can go to their final position in mid to late June as well. When moving plants from greenhouse to outdoors it is a good idea to condition them to the move. In the greenhouse keep pinching off the side shoots from your tomatoes and keep an eye out for pests such as aphids, whitefly, red spider mite. If you are subject to attack by these pests it is worth checking out biological controls as these are perfectly safe to use and, used correctly, more effective than traditional chemical controls. Many of the chemical controls of the past are no longer available anyway so the organic alternatives are now the mainstream choice. On the subject of pests, the infantry brigades of slugs and snails are attacking at ground level so take action to keep them down and don't ignore the air force of birds that are dropping from the skies to eat your crops. Don't forget the netting. 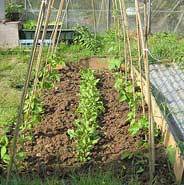 French beans can be directly sown now and if frost has caught you by surprise killing your first sowing of runner beans, it is not too late for a second try. The maincrop peas climbing the netting for 1.5 metres go in now as do the maincrop carrots if they're not in already. The beetroot sown at the end of June can be left to swell and store with the root vegetables whilst the earlier sown are taken at golf ball size to go in salads. The swedes go in at this time as do the turnips but remember swedes are brassicas and can be vulnerable to club root. Extra lime in the soil and start off in fresh multi-purpose compost. Varieties such as Marian show resistance to club root. Your squash, pumpkins, courgettes and marrows should go out this month. Take the opportunity to prepare for planting at the start of the month. 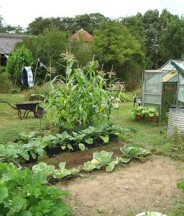 If your sweetcorn are not sown yet then you need to get going with them. The longer the season the better with sweetcorn. Even if the weather is fine, leave them under cloche until the leaves are pushing the edge as the extra heat will help. The outdoor cucumber can be started directly or in a pot to go out late this month. The flavour of the outdoor varieties seems more pronounced than the greenhouse types, but they do like a sheltered warm spot if possible.